Maybe you're excited about your early green tomatoes. Or maybe it's fall, right before first frost, and the plants have a few green tomatoes left. Or, maybe like us, your summer tomatoes come down with disease right after they set loads of fruit, and you have to rip them all out and burn them. Whatever the reason, if you find yourself with a basket of green tomatoes, then Southern Fried Green Tomatoes is the classic solution. 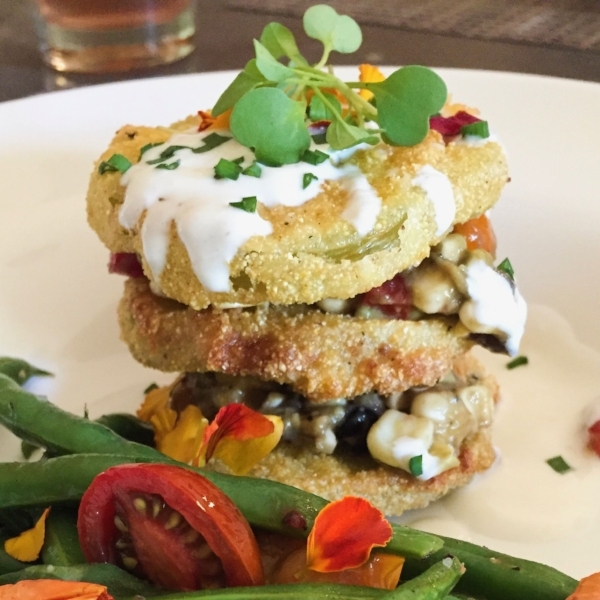 Southern fried green tomatoes were created to take advantage of summer's most favored vegetable, even if it's not ripe. They are soft inside with a crispy cornmeal coating. Iggy keeps his simple with a pinch of cayenne and garlic, and drizzles of tangy Buttermilk Crema. These are thick and meaty, robust enough to anchor a summer vegetable plate. Serve them with tangy sides like a green bean salad, or watermelon and feta salad. Personalize these by mixing your favorite spice blend into the cornmeal mixture. Don't be tempted to cook them in a deep fryer, the movement of the oil tends to shake off the batter. Fried green tomatoes are best when cooked in a cast iron skillet. Serves 4. Make the crema by combining all ingredients (can be made a day ahead). Cut off the stem end of the tomatoes, then cut tomatoes into 1/4" slices. Set aside. Whisk eggs and buttermilk together in a medium-sized bowl and set aside. Blend together cornmeal, 1/4 cup of the flour, cayenne, salt and garlic and put into a shallow bowl or dish. Put remaining 1/4 cup flour in a separate shallow bowl or dish. In a large cast iron skillet, add 1/4" to 1/2" of cooking oil and heat to 350 degrees. Line up the flour, egg mixture and cornmeal. Dredge each tomato slice first in the flour, then the egg mixture, then the cornmeal, and immediately add to the skillet. Do not crowd the pan or the temperature will drop. Fry for about 2 minutes on each side - until they are golden brown. Remove to a rack to drain and serve immediately. Overlap 3-4 tomato slices on each plate and drizzle with Buttermilk Crema. Garnish with chives, basil or micro arugula. Serve Southern Fried Green tomatoes as hot as possible, although they're not bad room temperature. You can make fried green tomato BLTs with any leftovers.